In the first of three round-up posts catching up on the stories of the past month, this blog looks at Formula E amongst other topics that have caught the spotlight. The inaugural season of the Formula E series is coming to a conclusion, with four races remaining. In the past month alone, there has been evidence of the good, bad and perhaps dodgy things that have been occurring across its output. The announcement that the 2016 Formula One season is provisionally set to start in April should be seen as good news within Formula E circles. Assuming that the second season it scheduled well, and initial indications suggests that will be the case, then Formula E should be able to gain momentum through January, February and March 2016 before the Formula One season begins and inevitably takes away a portion of its reach. Starting off with the good news, and that is that Formula E is using new technologies effectively and to their advantage, for example live video streaming app Periscope. Using Periscope allows fans to get closer to the action, giving them a virtual behind the scenes pass, meaning that they can interact with teams’ and drivers’ instantly. Another app that the electric racing series has been using is Grabyo, which allows rights holders such as Formula E to post short video snippets straight to Twitter instantly, which is exactly what they did with the turn two crash at the Monaco ePrix. The key word with both Periscope and Grabyo is ‘instant’. Because instant communication is what social media thrives on, and it is fantastic to see Formula E exploiting these new apps to their advantage. Planned or not, it always helps when someone with nearly eight million Twitter followers shares one of these clips, as footballer Cesc Fàbregas did a few hours after last Saturday’s race. I’d be fascinated to see just how many people Formula E managed to reach with the Grabyo clips, and how many people then went and watched a few more of their clips. There were a few negatives coming out of the Monaco ePrix weekend. The first surrounded the direction, which, as expected for Monaco was controlled by the local host. The camera angles that viewers saw were typical of Monaco, they were the same as the angles used during the F1, and given Formula E’s lack of speed, it didn’t paint the series in the best of ways. However, it did make me appreciate the fantastic work that Westbury Gillett and team have done so far this season in bringing out the best of Formula E with brilliant direction that gets the cameras as close to the cars as humanely possible. Accounts related to Destination Luxury ‘mass retweeting’ content related to Formula E.
There are two personnel changes to keep an eye on next Saturday. Mike Conway replaced Dario Franchitti as colour commentator for Monaco due to Franchitti’s Indianapolis 500 commitments, which presumably means that Franchitti will not be commentating on next Saturday’s Berlin ePrix either. Elsewhere, Andy Jaye is replacing Jennie Gow as ITV presenter for Berlin and the Moscow ePrix in early June, as Gow is covering the Monaco and Canadian Formula 1 events for BBC Radio 5 Live. Jaye covers speedway for British Eurosport, so is a good choice to replace Gow. As of writing, ITV have not confirmed coverage plans for the London ePrix on June 27th and 28th, however, the Sunday action clashes with British Touring Car Championship, so one of them will need to be moved to ITV.com, or hopefully moved to ITV’s main channel. The last Formula E note is frankly bizarre. I tweeted about Formula E at the end of April and was slightly surprised to see that 108 ‘people’ had retweeted the tweet. After closer investigation, including looking at some of the other Formula E tweets, it was clear that it wasn’t actually 108 unique people. 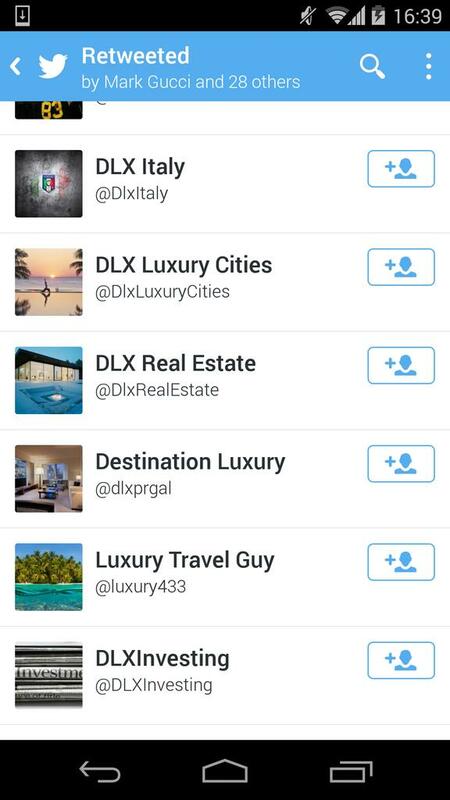 At least 50 of those accounts originate from a group called Destination Luxury (DLX). I’m not sure whether this falls under the category of Formula E buying Twitter followers in order to boost the retweet numbers, but it looks a bit strange to me in any case. 2015 started off brilliantly for Formula One Management (FOM). A slick-looking graphics set. A new-look website. Advances in the social media department. Unfortunately, the appalling direction is a continuing frustration with the bi-weekly Formula 1 product. The direction came to the forefront of this blog’s attention during last year’s Canadian Grand Prix, where it has remained ever since. Is this an appropriate shot for the start sequence? Decisions made by the directors (or whoever controls the pictures that viewers worldwide see) are left to be desired. For me, there are two major issues at the moment. The first surrounds the start sequence. 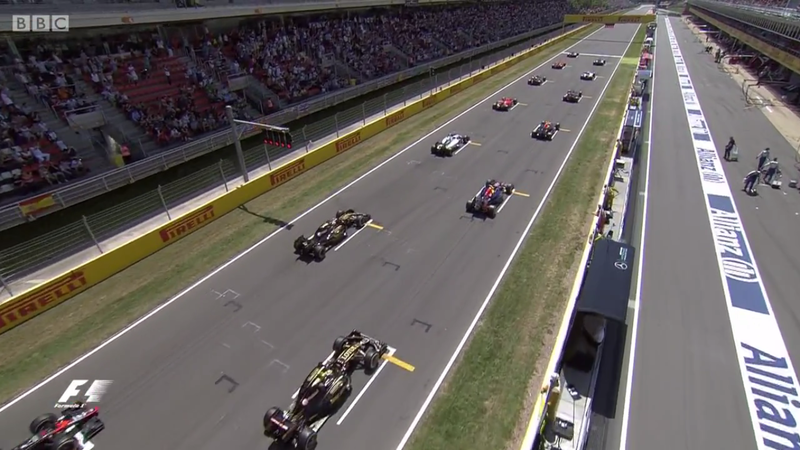 Recently, FOM have been experimenting with shots such as the above for the race start. The problem that I have is that the shot is inappropriate for the race start, irrespective of how many seconds the shot remains on the World Feed for after the green light. By all means use it half way through when there is not as much action, but don’t use it at the start. The direction was further exasperated in Spain when FOM went to a helicopter shots during the first lap. On lap 1, I want to identify cars as easily as possible, and track the running order. In essence, the shots need to be stable for this to happen. I don’t like FOM’s direction as of late, and unfortunately it is part of a downward trend that has been taking place for many years now. With BT Sport focussing all of its efforts on MotoGP, it appears next weekend’s coverage of the Indianapolis 500 on ESPN will be a copy of the US feed rather than BT adding any of their own colour to it like last year. Coverage starts at 16:00 next week, with no Motorsport Tonight segment like last year in the schedules. Last year, BT Sport 2 went on air at 15:30, with an hour of studio talk before handing over to their American colleagues. It shouldn’t be too much surprise if BT have decided to just take the American feed, because the approach they took last year was derided a fair amount on social media, with the negative comments outweighing the positive comments. In fact, it looks like both Motorsport Tonight and its MotoGP Tonight counterpart have been permanently axed from BT’s schedules in exchange for The Chequered Flag and BT presenting every MotoGP race on site. This week has been a reminder that series such as IndyCar only get coverage in the UK whenever a bad crash happens. Multiple media outlets covered the heavy crashes of Helio Castroneves and Josef Newgarden during practice for the Indianapolis 500 including the BBC and The Times. Let’s hope that the next eight days pass without any other major crashes occurring during the build-up to the Indianapolis 500. That is because up until now Bernie, FOM et al, all get paid whether or not anybody actually watches the race on tv. In moving to pay tv for half the UK races the viewing public was cut to a fraction of the original FTA and good BBC coverage. But it was done for money of course. Unfortunately Bernie has recently become infected with Tony Blair syndrome and wants to dumb everything down to the lowest common denominator in the hope that F1 can be saves from the unholy mess he has manipulated it into. Sadly only a major financial re-construction will save F1 and that is not going to happen. The underlying web of secret deals and contracts, (some of which directly conflict the regulations) is so tightly tangled that only a sharp knife like a second EU Commission investigation into F1 can break the parties free of one another. The FIA and FOM are thought by some, to be in breach of the conditions laid down by the first EU Commission F1 ruling. The gross unfairness and hypocrisy, which celebrates might and power over sportsmanship and fair play, is almost obscene. That the tv direction is now appalling as is the lack of BBC sound level and production is just a symptom of a dying enterprise. To call it a sport is no longer apt. Oh and by the way what on earth happened to Radio5 live after James had left the booth, the mics were left open, then we had some engine noise then silence then someone saying “Where is Mark?” the more engine, the more open mic from somewhere. I turned off in disgust in the end. Very Poor show of sound engineering BBC R5 Live! Sound engineers and or directors need to stay out of the bar long enough to close down properly.